On December 1, sixteen volunteers from World Bank participated in a Canal Pride event where they worked on beautification and preservation projects at Great Falls. A small group of volunteers joined Billy Goat Trail Steward Bob King to hike along Billy Goat Trail A, where they removed a lot of left behind trash as well as helped restore some off-trail areas. C&O Canal Natural Resource Coordinator Kristi Shelton took another small group of volunteers up to Marsden Tract to help her close off a social trail for planned natural restoration, while a third small group joined Interpretation Ranger Mark Myers to clean and decorate the Historic Great Falls Tavern Visitor Center for the holidays. 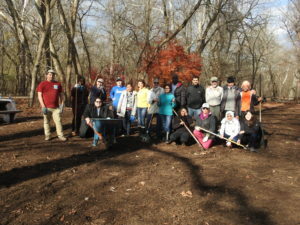 The remainder of the volunteer team removed fallen leaves and spread mulch in the Great Falls picnic area. If you would like your company or community organization to participate in a C&O Canal Pride clean-up event, please visit our Canal Pride page or email Director of Programs and Partnerships Becky Curtis. You can view more photos from the day on our Facebook page.